Three men in their late 20s were shot on Deering Road near Blue Hill Avenue in Mattapan on Tuesday. 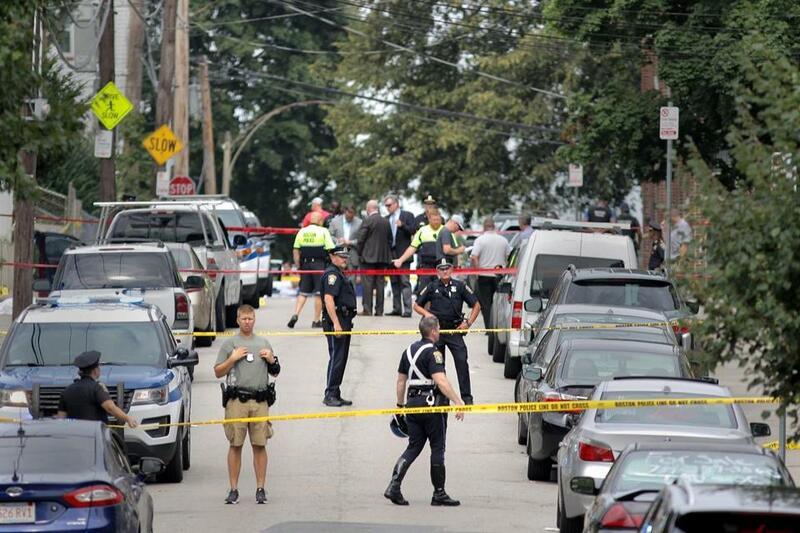 One person was killed and two others were wounded in a broad-daylight shooting in Mattapan Tuesday morning, Boston police said. The shooting took place around 9:48 a.m. on Deering Road near the intersection with Wellington Hill Street. One person was later pronounced dead, police said. The two other victims suffered injuries that were not believed to be life-threatening. Boston Police Commissioner William G. Gross spoke to reporters at the scene Tuesday, saying all three victims were men in their late 20s. Gross said at one point the three victims were in a motor vehicle. By about 1 p.m., the street lined with triple-deckers had been reopened, and cleanup crews were pressure-washing blood from the sidewalk. Shocked and bewildered residents were still gathered on porches in the neighborhood, talking in hushed tones about the incident. Gross said the department is working hard to stop gun violence and asked that the public do its part by cooperating with police investigations. “Folks, the cold hard fact is: There’s too many guns on the street,” he said. Gross said Boston police have removed 400 guns from the street this year. He also said there were 131 nonfatal shootings by this time last year, and this year there have been 91. Harold Meyers, who lives across the street from the scene, said he heard at least five shots at the time of the shooting but stayed inside. Meyers said most neighbors keep to themselves, but more vigilance might have prevented the shooting. Gross noted that police recently made an arrest in connection with the homicide that occurred at 34 Claybourne St. in Dorchester on June 5. Gross urged anyone with information about the Deering Road triple shooting to contact the homicide unit at 617-343-4470 or by sending a text to 1-800-494-TIPS. John R. Ellement of the Globe staff contributed to this report. Jerome Campbell can be reached at jerome.campbell@globe.com . Follow him on Twitter @JeromeRCampbell.Emily Sweeney can be reached at esweeney@globe.com. Follow her on Twitter @emilysweeney.